Two trailblazers in their fields will grace the stage during the 11th commencement at the University of California, Merced. Bachelor’s, master’s and doctoral degree candidates will hear words of wisdom from Administrator of the Federal Aviation Administration Michael Huerta and entrepreneur and engineer Dado Banatao during commencement ceremonies May 14 and 15. Huerta, who has managed complex transportation challenges in the private and public sectors, will address more than 650 candidates from the School of Social Sciences, Humanities and Arts during the May 14 ceremony. As FAA administrator, Huerta is responsible for the safety and efficiency of the world’s largest aerospace system, overseeing the agency’s more than 47,000 employees and a budget of nearly $16 billion. He was nominated in March 2012 to lead the FAA and was sworn in to the position in January 2013. 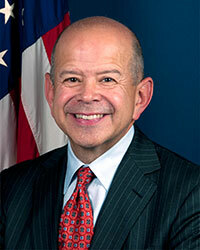 Huerta served as the FAA’s deputy administrator from 2010 to 2011. Huerta has held key positions, serving as an executive with Affiliated Computer Services — a large transportation technology services company — and as a managing director for transportation with the Salt Lake Olympic Committee. He also served as executive director of the Port of San Francisco, as commissioner of New York City's Department of Ports, and in senior policy positions at the U.S. Department of Transportation. Huerta graduated from UC Riverside with a bachelor’s degree in political science. He earned a master’s degree in international relations from the Woodrow Wilson School of Public and International Affairs at Princeton University. Banatao, who pioneered the chip set and graphics acceleration architecture that can be found in every PC today, will address about 450 candidates from the schools of Natural Sciences and Engineering during the May 15 ceremony. Banatao is the managing partner of Tallwood Venture Capital, which invests in semiconductor technology solutions for computing, communication and consumer platforms. Prior to forming Tallwood, Banatao was a venture partner at the Mayfield Fund. He co­founded three technology startups: S3, Chips & Technologies, and Mostron. He also held positions in engineering and management at National Semiconductor, Seeq Technologies, Intersil and Commodore International. As an engineer, he is credited with developing several key semiconductor technologies and is regarded as a Silicon Valley visionary. Banatao holds a bachelor’s degree in electrical engineering from the Mapua Institute of Technology in the Philippines and a master’s degree in electrical engineering from Stanford University.